2 million Japanese Christians live in Japan, which is only 1.6% of the Japanese population. 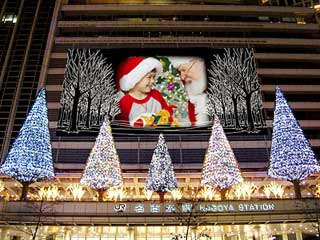 Most Japanese enjoy celebrating Christmas, regardless of their spiritual beliefs. It is a funny custom. When I was a kid, I believed Santa Claus gave me a gift if I was a good boy. I learned about Christmas from my parents and my kindergarten teacher, but not from Christians and ministers. My family was not Christian, but we had Christmas parties. We did not sing any gospel songs. We sang some Santa Claus songs in Japanese. When I was young, I didn’t know Christmas was Jesus’ birthday. I enjoyed the party and gift from my parents. When I got a girlfriend, I knew I would have to spend time with her on Christmas Eve. We exchanged gifts. The young man has to buy a more expensive gift than the young women has to buy. Of course, the young man has to pay for dinner and a hotel, if necessary. It is a common rule among singles. It is not so bad for men, because most women do not want to be alone on Christmas Eve. It is a huge opportunity to impress a new girlfriend. One of my friends told me this day was the toughest in the year, because he had to choose one girl from his several girlfriends. So, it is the worst day for playboys in Japan. I don’t know why most Japanese eat chicken for Charismas Eve dinner. Most families do not have big ovens. They have to buy grilled or fried chicken at the stores. No doubt, KFC could make record sales at that time of year. We should give as we would receive, cheerfully, quickly, and without hesitation; for there is no grace in a benefit that sticks to the fingers. ~Seneca Nice Comment Keep it up! My friend and I were recently discussing about how we as a society are so hooked onto electronics. Reading this post makes me think back to that debate we had, and just how inseparable from electronics we have all become. I don't mean this in a bad way, of course! Ethical concerns aside... I just hope that as technology further innovates, the possibility of copying our brains onto a digital medium becomes a true reality. It's a fantasy that I daydream about almost every day.